My Wish was Granted! | Portraits of M.E. Last week I received an email from Paperback Swap – the email was titled “Your Wish Has Been Granted”. My “Wish List” on Paperback Swap isn’t very long. I think I have about 8 or 9 books on it. I haven’t updated my “Wish List” lately either, so the books I have listed are ones I have requested over a year ago. (Yes, you have to be patient when using PBS.) To receive this email, about a book I’ve been waiting to become available for over a year, was exciting news. I quickly clicked on the email to see which book I was going to receive. I was not disappointed when I read it was the trilogy series by Ted Dekker called “The Circle Trilogy”. 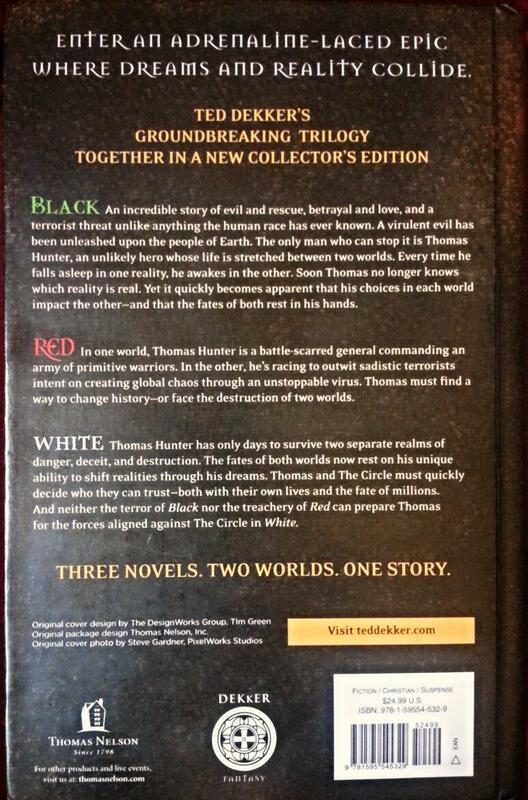 The Circle Trilogy includes three books: Black, Red, and White. Since I am still reading the two books I began in March, I won’t be adding this book to my reading list for this month. I will probably add it to my reading list for June or July. There are still a few books ahead of this one that I want to read first. And since the Trilogy includes three separate titles, it’ll most likely be the only book on my reading list when I do get to it. Faithful Reader: Of all the many possibilities, what is the single most important concept you would like readers to take away from the Circle trilogy? Ted Dekker: The Great Romance. We were created for intimate fellowship with our creator. In the end he will go to great extremes to woo us back into that relationship. Anyone else out there a Ted Dekker fan?